At CES 2019, SECUREDATA presents its innovative technology. These modern and innovative devices push the boundaries of data protection and leverage a decade of the company’s data security knowledge. Integrating portable data storage and the smartphone experience gives users a truly unique experience and product. SecureUSB BT and SecureDrive BT presented at CES 2019. Today SECUREDATA officially has launched its new hardware-encrypted USB flash drives SecureUSB® BT and SecureUSB® KP, on the first day of CES 2019. At this trade show, the devices will be on display for top media, industry leaders, and technology enthusiasts. Starting today, both products are available to the public for purchase on securedrive.com. SecureUSB® KP and SecureUSB® BT both use patented DataLock® KP/BT technology licensed from ClevX, LLC. SecureUSB® BT is the world’s first hardware encrypted flash drive that requires user-authentication via a mobile device (Android/iPhone, tablet or Apple Watch). The device is remote management ready with GPS based geo-fencing, time-fencing, remote wipe, and remote unlock. It is Host-OS independent and works with any device that has a USB port, including TVs, printer/scanners, DVRs, thin clients, and embedded systems. First ever hardware encrypted flash drive that can be unlocked via AppleWatch. 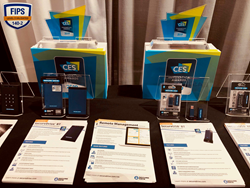 SecureUSB® BT will be on display at the 2019 CES Innovation Awards Showcase along with its sister product SecureDrive® BT, which was recognized as CES 2019 Innovation Award Honoree in the Computer Accessories Category. SecureUSB® KP is a hardware encrypted flash drive with user authentication via onboard keypad and FIPS compliant design. It has a built-in antivirus designed for USB Drives, with optional Automatic Cloud Backup to major cloud providers. It provides a secondary software encryption layer with a separate key for files in transit to the cloud and at rest in the cloud. SecureUSB® KP is OS independent and works with any OS. It features the most secure hardware encryption. No encryption info is exchanged between the drive controller and the Host Operating System. SECUREDATA, Inc. is a privately held company, headquartered in California, USA. SecureData offers a range of tailored high-level data protection capabilities through a set of services and products. These include hardware encrypted portable data storage devices, backup solutions, file repair software, data recovery, and digital forensics services to help clients achieve their data security objectives. SecureData has a presence through its partners in North America, Europe, Middle East and Africa (EMEA), Asia and South America, and serves companies and organizations in regulated industries, such as government, financial services, military, law enforcement, legal, healthcare, and education. ClevX is an IP/Technology development and licensing company – Your Innovation Partner. It is focused on the Security/Mobility markets where ClevX pioneered its award-winning DATALOCK® KP/BT Secured USB drives (OS-agnostic, hardware encrypted, PIN- or Phone-activated, bootable) and easy to use portable software applications for secure drives for personal and business use. ClevX differentiates itself by creating solutions that are simple, clever, and elegant.